You may have thought that by 2015 we would have a completely wireless society. It seems as though with every new piece of technology comes a new cable along with it. Not only do we have more cables than ever, but we now also have an endless sea of adapters to connect older & newer versions of technology. Luckily, Katstar has you covered. Some of our most popular cables are for HDMI connections. HDMI (High-Definition Multimedia Interface) is the digital video standard of TV & Computers today. The quality of HDMI is excellent due to the fact that it serves uncompressed video & audio to your screen. With this new technology comes a new cable. There are a few different types of HDMI cables, the basic cable is appropriate for 720p or 1080i screens. If you have a 1080p, 4K, or 3D screen however, you will need to use a high speed HDMI cable. If you want to send video to a screen far away from the video source, perhaps in another room, then you will need to use an HDMI extender. HDMI signals can deteriorate over longer distances, so an extender or splitter is the perfect tool for handling this job. Another popular type of cable that we carry here at Katstar is the USB (Universal Serial Bus) cable. As its name suggests, this cable is truly universal. It can be used in computers, televisions, cameras, video games and just about any other piece of technology. Many modern computers are including fewer and fewer ports in an attempt to save space. The new 2015 Apple Macbook for example, has only one single port! For most people this is simply not enough, so if you have one of these modern laptops we highly recommend getting a USB hub to add more connections. This will allow you to easily connect a mouse, keyboard, or other peripherals to your computer. Like the HDMI cables, there are a few different types of USB cables. Before you buy, make sure you are selecting the correct one, as the connections will be slightly different. Cameras & external hard drives often use micro-USB cables. It’s best to be sure exactly what your technical needs are before ordering, but if you’re now sure feel free to give us a call and we can talk you through it. So if you’re in need of HDMI, USB or any other type of cable, give us a call today! We even have bulk cable packages that will cover all your needs. Printers. They all do the same thing. They take what’s on the computer screen and print it onto the page. Some do it faster, some print in better quality, some are more reliable, but the end result is basically the same. So why is it always so hard to buy printer supplies? It seems like every model of printer has a different type of ink cartridge and toner and ribbon. Over the course of my life I’ve probably wasted hours hunched over in the store isle, squinting at labels trying to find the one with the exact number I need, only to realize that it’s not there. So I decided there had to be some way to make this easier. This is where Katstar can help. We have an exhaustive catalogue of printer and copier supplies, including inkjets, laser toners, fusers, ribbons, and thermal fax supplies. Our website’s custom search function makes it easy to find exactly what you need; just type in the make, model, or part number. Each product displays with a detailed photograph, so you can ensure it’s exactly right. Katstar also makes it easy to be socially responsible with your purchases. 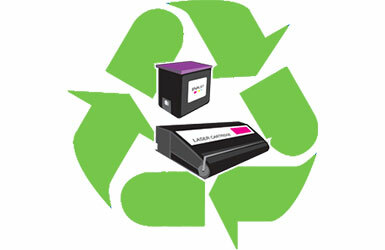 We have sections for recycled ink cartridges and for products made in the United States. All of our print products meet or exceed OEM specifications, and we have a 100% customer satisfaction guarantee. Katstar isn’t just for printing supplies. We stock a variety of electronic accessories. Our selection of batteries and chargers is unparalleled. Finding replacement batteries can be a huge pain, especially for older products, but Katstar’s catalogue has it all. Camcorders, cellphones, laptops, power tools, you name it—Katstar has an extensive selection for many brands and a search function to help you find what you need. And if you can’t find the right battery and charger, Katstar offers a wide selection of adapters. And then there’s cables! From audio-video cables, to fiber cables, to internet cables, Katstar has just about everything. All of our cables are of the highest quality and sold in a variety of lengths. We also offer connectors, gender changers, wall plates, and wiring devices to fill all of your cable needs. If you’re an electronics company, Katstar offers great deals on bulk cable purchases. Whether you’re a business looking to stock up on supplies or just someone in need of supplies for your home office, check out Katstar. Our website takes away the hassle of shopping and promises the best in quality. When you chose Katstar, you chose a partner, not just a vendor. Katstar is a great source for cables, batteries, and printer cartridges. They are a reseller of Printer supplies, Bulk Cable, PC and Network cables, and Batteries at low prices. All of this with great customer service. With such great prices, it is hard to beat. Their website makes ordering so easy and there is a lot to choose from! Free Shipping in USA on Orders over $100 and under 15 pounds is a steal so make sure to take advantage of that. The batteries section of the website is reason enough to only go to Katstar. All of those batteries that you need but do not know where to get can now be bought easily and shipped right to you. No more throwing your wireless phone away because it never holds a charge. No more needing to have your laptop plugged in at all times because you can buy another one and have the wireless freedom you always had. They have everything from two way radio batteries to digital camera batteries and power tool batteries. You will ultimately save money and allow your electronics to function longer. To say that this is your source for cables is an understatement. Do you need cable, bulk cable, cable ties, or custom cables? The number and diversity one can purchase here is great. They will fulfill any need for cables; this saves time so you do not have to go on a search engine to find your cable on a random, less than reputable, website. Will the cables work? Will they get my order right? If they get it wrong, is a refund going to take unnecessarily long? Shielded cable, PVC cable, audio cable, and telephone cable, you name it, they probably have it. For offices and homes alike, printer supplies are always needed. Laser toner, inkjet toner, paper, and staples can all be ordered and shipped to you. This is a great way to take advantage of the free shipping for orders over $100 and under 15 pounds. You will always need these for home use in printing documents and photos while this can also help in office use for heavier print jobs. Becky, the print specialist, is also always a phone away to help with any questions. She makes it easy to determine which printing products you need. Data protection and backing up your data are a huge aspect of any business. Keeping your data safe is one of the first steps toward success. IDE and SATA RAID 1 Hardware Disk Mirroring Devices and EzBackup Drives Complete Backup Solutions for Laptop or Desktop are available. These are great options toward securing your data. Do not hesitate to choose Katstar as your source for any or all of these products. Let them help you in your business and success. Leading online retailer A******** is now charging sales tax in many states. Not having to pay sales tax is one of the many reasons people buy online. The outcry from the bricks & mortar community is part of the reason that the government was going after you know who. While their compaint was a legitimate one now that some online retailers are charging tax it is not going to help the bricks and mortar businesses. It has only served to help the government. People who shopped online will not suddenly decide that it is cheaper to shop locally. People shop online because of the fuel prices, item prices, greater selection and the convenience of shopping from home. Many online retailers still do not charge tax. They will be getting my business as opposed to A**** who we used to do a lot of business with. Only 5 states do not have sales tax. As an online retailer, I know I do not want to have to report to 45 state agencies because I made a sale. The bookkeeping would be costly. We do make that much profit. A****** was leading the fight as the biggest online retailer. It is a shame that they gave up the fight. My guess is that somebody’s price was met. Here you can learn more about the products and services we offer. Check in from time to time to see our online specials.